The Federal Reserve members bid farewell to Ben Bernanke at his last formal FOMC meeting on January 29th, 2014. The story surrounding his departure as Fed Chairman for me is what he has taught the investing community about the power and limitations of Federal Reserve policy. In addition, the forming story is that investors are beginning to adjust their portfolio to deal with the 800 lb gorilla he is leaving behind for Chairwoman Janet Yellen to manage. His legacy, in my opinion, will be shaped by what happens to the $2.4 Trillion dollars (and still growing) in excess reserves currently on deposit at the Fed in the U.S. banking system. Through the years that I have followed Ben Bernanke, a consistent aspect of his testimonies has been his contention that the unconventionally large Fed asset purchases would not be inflationary. Many astute investors listened to his comments in disbelief, riding the gold momentum trade up to $1700, and then back down to $1200. 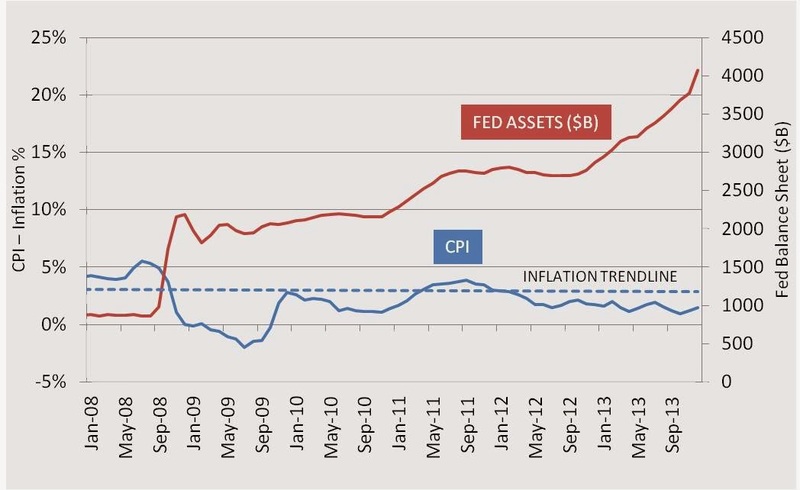 As it turns out, Ben Bernanke was precisely right, at least so far, as you can see in the chart below. The inflation trend line since the 2008 crisis, despite the increase in the Federal Reserve balance sheet from $1T pre-crisis, to over $4T today, has continued to move downward. This trend is a continuation of a long term cycle that began with the reign of Paul Volcker as Fed chairman back in 1980. What the information highlights for me in researching the enigma of inflation is that price levels are indeed a monetary phenomenon, but if the money is constrained from reaching the general economy, then consumer price inflation will struggle to ignite. For evidence of the efficacy in the banking regulation mechanism in constraining lending, I looked into the aggregate statistics for the U.S. banking system since January of 2008. In the chart below you will see that total bank assets grew from $11T at the beginning of 2008 to $14.1T at year end 2013. The growth in total assets was 28.1%.